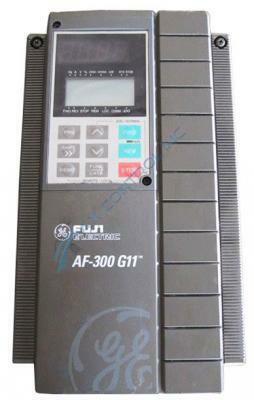 The General Electric Fuji Electric 6KG1143005X1B1 is a 5 horsepower controller that is a member of the AF-300 G11 drive series. A 3 phase drive, 6KG1143005X1B1 is capable of inputting 460 volts with a frequency of 50/60Hz. The drive outputs between 380-460 volts with a frequency of 0.1-400 Hz with a rated output current of 9 Amps. The unit includes a factory installed keyboard panel that is mounted on the front plate of the drive. A NEMA 1/ UL Type 1 enclosure surrounds the driver, weighing 8.4 pounds and measuring 10.24in (H) x 5.91in (W) x 5.71in (D). The front plate is attached to the drive with two mounting screws. Loosening those screws allow for front plate removal. Following the removal of the front plate, the factory installed keypanel can be accessed for removal. Proper storage is imperative with 6KG1143005X1B1. The relative humidity and temperature of the operating facility can damage the drive or can result in a fire or an accident. Drive insulation is crucial to keep moisture and condensation from corroding the capacitors. The temperature of the operating facility should range between -10℃ to 50℃ (14℉ to 122℉). If the environmental temperature is to be higher than 40℃ (104℉), then the ventilation covers need to be removed from the driver to prevent damage. Be sure to install the drive and heat sink in a clean area free of debris, as the drive will be hot. With the heat sink capable of reaching temperatures of 90℃ (194℉) proper installation is necessary to avoid accidents or fires. Refer to the specified instruction book for safe installation.